An entrepreneurial mother, and a meritorious Canadian son. 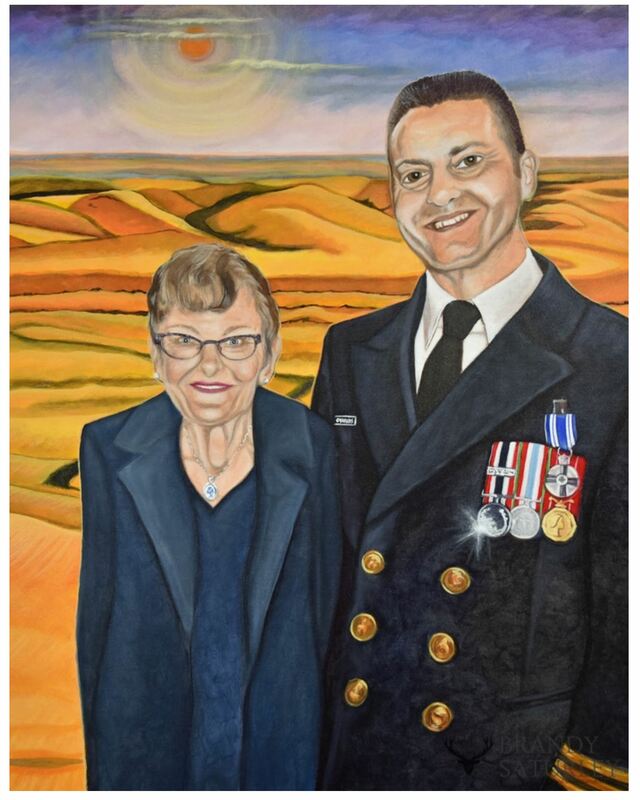 What does it feel like to receive a Meritorious Service Medal from the governor General of Canada, with your mother and family at your side? In creating the most recent portrait for the People of Canada Portrait Project, I had the privilege of expressing the answer to this question, on canvas. This story began in Empress, Alberta where Alice Rinker was born in 1932. An only child, Alice was observant and curious, which is likely what drove her to explore her options and further her education. She later settled in Medicine Hat where she married, started a family business with her husband and raised seven children. She survived the loss of two husbands and the raising of seven children, no small feat for a woman of such petite stature. So, put yourself in Alice’s shoes. You are a hard-working, homesteading, entrepreneurial, and proud prairie woman. 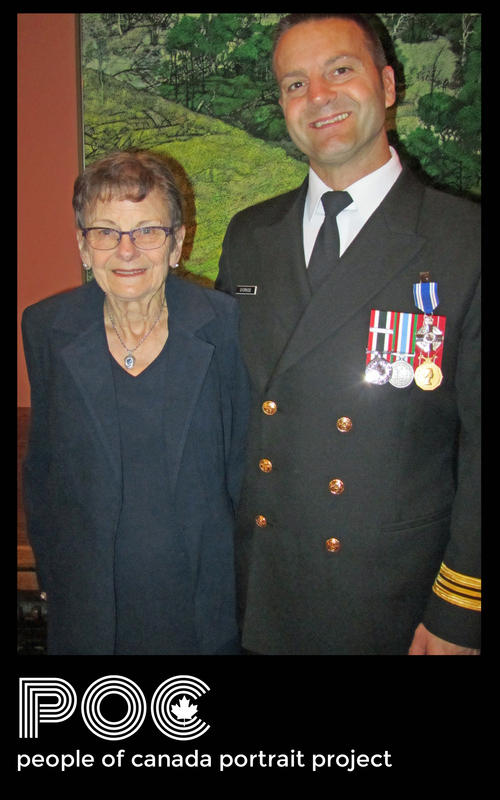 One of your sons, Aaron Gyorkos, earns a degree in Biology/Oceanography from University of Victoria, joins the Armed Forces and becomes a career Naval Officer. He serves his country all over the world, from combat to commandment of school projects, to project management. You receive word that your son is going to receive a Meritorious Service Medal from the Governor General at Rideau Hall in our nations capital city, Ottawa, in Ontario Canada. Imagine the emotions of this day, between mother and son and family. This photo was taken shortly after this momentous occasion, inside Rideau Hall, and those beaming smiles are undeniable. When I received this photo I was unaware of the occasion, as I reached out to the family for more information and additional photos I came to realize the full picture and weight of the day. This is where my emotions kick-in and my mind begins to drift from the photos, to the locations expressed in my written interview with the family and the process behind this portrait project. With this project I have been taking the background from the submitted photos and replacing it with a Canadian landscape or location that I feel suits the personalities and emotions of the people in the portrait. I want the portrait to tell a complete story, without words. I’m not just creating portraits of Canadians, I am creating portraits of Canada. Figurative landscapes that will communicate stories for generations to come. I’m not sure if I am always ‘hitting the mark’, but I am working hard to honor the people and their stories, combined with my signature style of expression as a visual artist. I work from intuition mostly and rely on what I ‘feel’ about my subjects. As with all the portraits in the series I am documenting the creative process behind painting the piece and sourcing unique music, that fits the tone of the piece as the soundtrack. As such I am searching for original music from young or historical Canadian artists. This story will continue to unfold on the People of Canada Portrait Project website in the months to come, for now you can enjoy the finished portrait here.